Note: If you don’t know your Myers Briggs Type, click here for a free, quick test to find out. Fun-loving Artisans (SP) like to play first and then work if there is time. Not fans of working for “the man” the SP would rather be hanging out with his buddies watching the game (or better, playing in the game) or chilling at a cool party where the action is than sitting in a desk all day as the clock mocks him. An SP would be happy as a self-employed person, relishing in being able to set his own hours and come and go as he sees fit. The person freedom that goes hand-in-hand with the entrepreneurial lifestyle will suit this type well. The only problem is getting there. SPs are notorious for wanting to be out where the action is, which means that it’s essential that some level of their business gives them the scope to have a good time. Many SPs like to work with their hands, so small businesses that allow them the freedom to do this on their own watch might be ideal. The biggest hurdle to self-employment will be discipline. It may be hard for the average SP to give up spending time with his friends or going hunting or fishing to put in the long hours required to begin any successful business venture. But if they can get through these difficult times and have chosen a field that meshes well with their skill set, they can do very well. It might be good for an SP to work with an N or a J (or better yet, both) so that they don’t have to worry about long-range planning and seeing the “big picture” of business, something that they often struggle with. These outgoing, gregarious types love to be where the action is. An ESTP is not shy, and certainly not always tactful! One of the best types of “telling it like it is,” they may not make the best salespeople, but they certainly can run an effective business, as they have a great deal of realism and common sense. And when I say “common sense” I mean “street smarts.” An ESTP is good at making a seemingly complicated situation very simple, and this has it’s place in the entrepreneurial world. They would be good at running a small business with a few employees in a hands-on field. If you are taking the time to read this article, congratulations! Not many ESTPs have patience for “wishy-washy” things like personality types, but it’s good that you are willing to come here and gain some self-insight. That’s the first step. Know yourself. You are going to be happiest working directly with people, probably in a hands-on and/or outdoor setting. Secondly, you’ll need a few good employees who are good at a trade. Hire some people, make sure that you can live on the profit, and watch your business grow. Figure out the kind of business you want to run. Stick to something simple, basic, and hands-on. Remember to keep your laborers content. Don’t work them any harder than you’d be willing to work yourself! 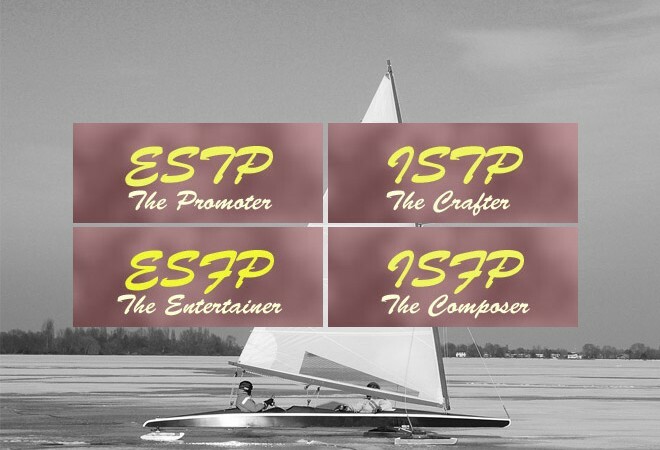 In the end, an ESTP can be a fun person to work for – they know how to relax and have a good time with their buddies at the bar at the end of a long day. And if they are running their own show successfully, they can be wonderful business owners who have a lot of common sense and a knack for getting a lot done with few resources. An ESFP is a lovable, charming and fun person. They are usually the “life of the party” types who are not afraid of being in the middle of things. Usually immensely popular throughout their lives, the ESFP can use their extensive knowledge of “what is in” and their people skills to be great salespeople and charming business owners. It’s important that this type not be chained to a desk or working alone for too long. They’d get very bored. And speaking of “boredom,” it is your enemy. If you are starting a business, you’ll need to learn some discipline, or it will be tough going. In order not to burn out, you should look into fields where you are working with exciting and interesting people and doing something that is a bit different every day. Owning a restaurant or running a theme park would be far more interesting to you than working as an investment banker, for example. Choose your business venture wisely, and base it upon your interests, or you’ll never get there. ESFPs usually don’t mind working a 9-to-5 day job if they enjoy what they are doing and like their co-workers. This type isn’t the most suited to self-employment because the business end of things will provide difficult for the ESFP to get a grasp on. If they can learn to see the big picture, the “light at the end of the tunnel”, not get bored and distracted, they can get there, but it may take some time. The people skills will help, but some ESFPs end up with a lot of great possibilities and then don’t know what to do with them! ISTPs are quiet, effective people who have a very realistic, hands-on and down to earth approach to life. They do not like to be bothered with nuance or theories and would rather just get down to action. This makes them great at working with tools, appliances and fixing things. Everyone should have at least one ISTP in their lives to be a “handyman” around the house. And speaking of handyman, what a great business idea for this type! You will likely want to build your business around one central theme. It should be something that you are well accustomed to doing yourself. In other words, don’t hire a bunch of people to perform a task that you know nothing about. You should, however, consider hiring someone to take over the financial part of the business – and potentially anything else that you are less inclined to enjoy. But make sure that you do these things yourself first so you can see how they run. ISTPs learn best by experience. It’s important for the ISTP looking to go freelance that they formulate some good structure and planning. Most ISTPs like to jump right in and tackle a problem, and much of the time this is a good approach, but when running a business they’ll have to learn to deal with the nitty-gritty details like financial planning, taxes and what to pay people. These aren’t the most exciting tasks, but knowing them well is necessary to run a good business. While often very gifted, ISFPs will sometimes struggle with self-employment due to high sensitivity and a tendency to avoid problems. Still, they often do find themselves in positions of business ownership by default. This is because they are multi-talented people, and usually have at least one area where they really shine. It is a bit of a paradox that they can be so “artistically inclined” yet often settle for mundane day jobs. An ISFP will also need to learn to look at him/herself honestly and assess his/her weaknesses and strengths before making the leap. You’ll want to pick something that you are good at and simply turn it into a business idea. It sounds easy on the surface, but having to keep track of taxes, payments, insurance, clients and records can be overwhelming at first for your type. You will also need to be very careful to be honest with your clients. Don’t promise more than you can deliver, and don’t be evasive and not get back to people. At the base of your evasive behavior is sensitivity, but you’ll need to get over this or your clients will learn not to trust you. On the positive side, you want to help people and you really do want to make a difference in the world. If you go forward with this attitude, nothing can stop you! Hire an ESTJ or an ISTJ to run the business end of things (preferably the former) but don’t let them take over completely! ISFPs are often really good at performing and visual arts. They make great actors, dancers and often good writers. Sometimes these can be translated into really great business ideas, especially if they are promoted well. An ISFP starting a theater or dance company, or something else for the common good may end up very happy and successful. This article is dated 2010 but the info is good. Is there an update by the writer on examples of business areas for each group in 2016. Nowadays 6 years is a lifetime.